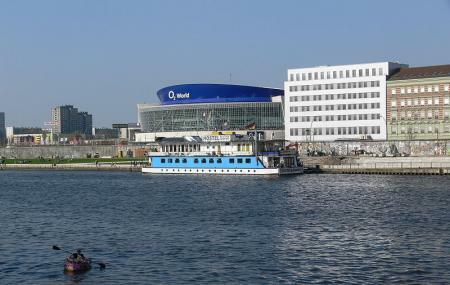 Find hotel near Mercedes Benz Arena Berli ..
Every concert lover in Berlin or in and around Germany knows of Mercedes Benz Arena. It opened up in the year 2008 and is one of the most coveted buildings of Berlin. It is basically an indoor arena that hosts a lot of indoor concerts, gatherings and performances. It was brought over by O2 Germany and is also known as O2 World to people. Mercedes Benz Arena is a definite must visit, especially if there are concerts being held at that time. The Mercedes logo spread over the ceiling and the liveliness of the place makes the whole vicinity come alive. The door opens 2 hours before the show starts. Outside food is only allowed if it has a medical certificate. Cameras and videography is not allowed. However, seek permission beforehand if you are keen in bringing your camera. By bus 248 and get off at “East Side Gallery (Berlin)” bus station. How popular is Mercedes Benz Arena Berlin? People normally club together Hamburger Bahnhof and Stasi Museum while planning their visit to Mercedes Benz Arena Berlin. I like the place, its beautiful, it is well located, there are many places to eat and nice stores around the area. But....it's important to know that every backpack or purse must have a size of A4 (21,0 x 29,cm) if it is bigger than that you have to leave it at home or in the special cabin during the event, you also have to pay like 5 euros(I think) and then after the event you get your belongings back. Jacket, purse, backpack or whatever, for security reasons. Now you know. What a great arena. The staff were great. The hockey was really good as well. If you are a hockey fan travelling to Berlin do yourself a favour and hit up a game. You'll be pleasantly surprised by the atmosphere. "Many thanks" to the security guard who refused to let me check for the Florence + The Machine concert with a bag, which was 2cm too big (the corners were easily foldable) with passport, money and important papers (format A4) inside! Hope he enjoyed the concert with my ticket. Will never go to Arena again, too stressful. I was about to have an amazing time I deserved and relax but didn't get it. Incredible building sponsored by Mercedes Benz. We were in an Ice Hockey match with friends and it was really exciting. Such a good experience. It is surrounded by restaurants and next to East Side Mall. Be aware! Don't bring a bag / back pack - bigger than 20*30 cm (a4) - they will make you pay 5€ for a locker! It's written in small letters on your ticket. Pay attention!